The doll is thousands of years old; it has been found inside the graves of little Roman children, and will be found again by the archeologists of a future date amongst the remains of our own culture. 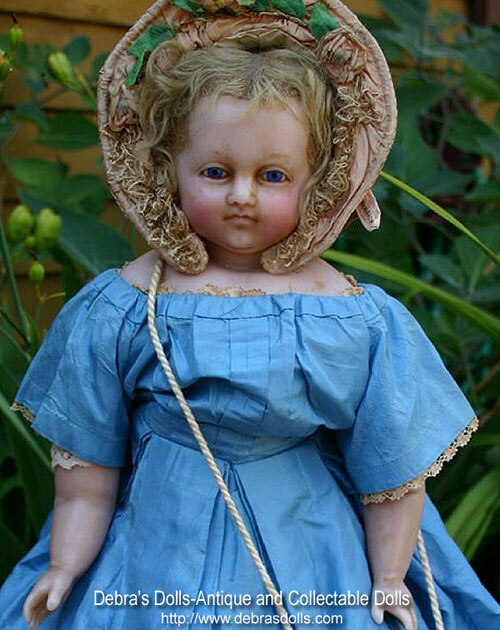 A popular antique doll that portrayed a baby was made in England from wax at the beginning of the 19th century. Germany, Switzerland, and France were the principal manufacturers of toys in the 19th century, but the manufacture of the antique wax doll was a specialty of England. 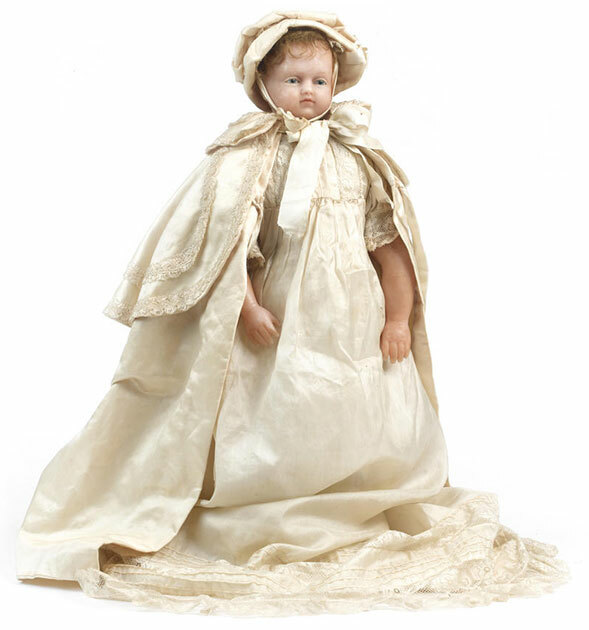 The French dolls had a reputation for beauty and tasteful dress while the English doll, made in the form of a child, was designated as a plaything. Because wax could mimic skin much better than either wood or papier mâché, wax dolls had beautifully realistic heads. The English antique doll was substantial and well made, could be dressed and undressed, was plain in her attire, and dressed like a child. It was very different from the French doll, arrayed like a marquise in silks and satins, with her eyeglass and her poodle dog. "In the North Transept Gallery, Class 29, Case 122, we find a rich display of model wax and rag dolls by Madame Montanari. These playthings are indeed very beautifully modelled, the hair inserted into the head, eyelashes, and eyebrows. They represent the different stages of childhood up to womanhood, and are arranged in the case so as to form interesting family groups. They include portraits of several of the royal children." Much skill and time were bestowed on the making of wax dolls to attain a high degree of perfection, but labor was cheap and plentiful. 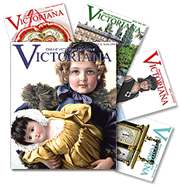 The number of people employed in the manufacture of antique dolls was astonishing, and in large establishments nearly the whole work took place on the premises, every person having his or her own particular work or specialty. In some of these establishments in London thousands of dolls were turned out in the course of a week. At least twenty different people were employed in making a single antique doll, not counting those who manufactured the raw material -- the wax, the eyes, the cotton, and the hair. Wax modelers would model a doll head in wax or clay, and then use plaster to create a mold from the head. Next, one person would make the head by pouring melted wax into the mold or cast of the head and features. Another person's entire work was to put in the eyes; with a sharp knife they cut away the wax for the sockets. After properly adjusting the glass eyes, they fastened them in by pouring a little melted wax in the skull, which when it came in contact with the glass, cooled, and kept the eyes in place. These little glass eyes were imported from Germany by the thousands in assorted sizes and packed in large cases. The more expensive antique dolls had hand-modeled eyelids and eyebrows. After the eyes were inserted in the head, the next point was the putting on the hair. This was an important consideration with the manufacturer, being the most costly part of the whole toy. In many of the best dolls the hair and its insertion cost as much as the rest of the head put together. No doll would be considered perfect unless its hair were natural and could be combed and brushed without injury. This work was all done by women. 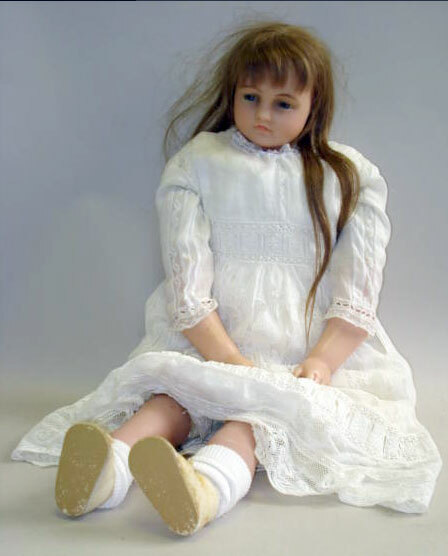 The doll head in be adorned was placed on a block, the operator holding in her left hand the hair, carefully combed and cut to a uniform length; in her right hand a dull knife, with which she lifted a small piece of wax, and pushed the hair underneath. When she finished this process, by inserting only two or three hairs at a time, she took an iron roller and gently but firmly rubbed it over the surface, thus fastening the hair securely on the head. This was a very tedious process, and only used in the more expensive dolls. In the less expensive or composition antique dolls, a deep groove was cut completely through the skull, along the top of the head where the parting was to be, and the uncurled ends of the ringlets were pushed in with a blunt knife, and then fastened down with paste. Black hair was almost entirely human, and was imported from Europe, while the flaxen locks were made of mohair. This material was specially manufactured for the purpose, and one manufacture in London supplied nearly all the locks for the English as well as the best French and German makers. The mohair was of a remarkably soft and silky texture, and was sold in little bundles of different lengths. Having finished with the doll's head, the body was next. A number of people were employed, chiefly women, assisted by the younger members of their families, each of whom took one special part. The manufacturer gave out a measured amount of cotton, and he knew to an inch how much material each dozen dolls would require according to their size. The body-maker took it home, and accomplished the work in the following manner: one person cut out the body of the doll, another sewed it, a third stuffed in the sawdust, and a fourth made the joints. In this way a family would produce many dozen in a week. The payment of this work was by the piece. The arms formed another branch of this manufacturing process, which other people were almost exclusively employed. Except for the very commonest class of dolls, the arms were made of kid below the elbow and cotton above; and in every case there was an attempt at fingers, although their number were not always correct. The price paid to complete these arms was incredibly small. The work-woman furnished the kid, cotton, and sawdust; for larger arms of approximately six inches long they received 6 1/2d. (about thirteen cents). Small arms for the cheaper dolls were worth only 1 1/2d. (three cents) a dozen pairs. In view of the fact that these workers furnished the material for the arms, this was not a well paying job, but was one to be done in the home. Putting the head and arms together was the last process. This was done with glue and thread. The doll was then wrapped in tissue-paper, and ready for the market. Most of the wax dolls made in England were exported, many to America. In 1850, Tuttles Emporium advertised “beautifully dressed” wax dolls from 50 cents to 10 dollars; “undressed” wax dolls from 25 cents to 8 dollars. In 1866, R.H. Macy & Co. in New York announced the arrival of “3,000 Fine Wax Dolls” just imported for the holiday trade. Bonhams (www.bonhams.com) hold four specialist antique toy and doll auctions a year, which cater for all tastes in the world of vintage Toys, Trains, Dolls, Teddy Bears, Doll Houses and Miniatures, Rocking Horses, Juvenalia, Automata, Lead Soldiers and Figures.